< Listen now to the Racin' for a Cure radio spot! Going from the February 22nd NASCAR race in Fontana, CA to the next race in Vegas on March 1st. 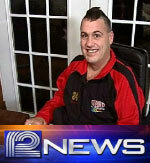 Scott will travel all 150 miles from Baker, CA to Las Vegas, NV by way of his wheelchair. After a successful 2008 racing season in the NASCAR Camping World Series East, Racin’ for a Cure heads into the off-season with hopes for new ways of raising awareness and funds for ALS (more commonly known as Lou Gehrig’s Disease). Corona, California (Wednesday, November 19, 2008) – One of NASCAR’s rising stars, Derek Thorn and the Racin’ for a Cure team have had a busy off season; taking a backseat to racing. As a team, they will be more focused on fundraising, raising awareness and funds for ALS research. ALS (Lou Gehrig’s Disease) is caused by the degeneration and death of motor neurons, the nerve cells which convey nerve impulses from the spinal cord to each of the body’s muscles. The death of motor neurons leads to paralysis of these muscles, including those involved in swallowing and breathing, and ultimately leads to the death of a patient, typically 2-5 years after diagnosis. “ALS is a horrible disease and has personally affected my daily life. Scott Pfeiffer, a good friend of mine that helped boost my career in the ASA Late Model and NASCAR Camping World Series, was diagnosed with ALS in May of 2007. Seeing him go from the healthiest guy I know to being stuck in a wheelchair unable to do normal daily tasks like, brushing his teeth to playing with his kids, weighs heavy on my heart. However, Scott never gives up and his attitude is an inspiration. He creates hope and drive in everyone he meets to find a cure for this disease. Racin’ for a Cure, started by Scott, was a great success in 2008, and in 2009 we’re looking to carry our success to a new form of fundraising. Together we can make a difference by reaching out to ease the pain this disease is causing to many families,” quoted Thorn. Help Stop ALS was founded in Corona, California with the creators of Racin’ for a Cure. It is devoted to inspiring and encouraging those affected by ALS while increasing awareness and raising money for research through fundraising; priding ourselves in one day being part of the cure. With the internet we can be in touch with people around the world. There are so many people working to find answers about ALS. Through our fundraising efforts, our website and by supporting families dealing with the challenges associated with this disease, we can do our part and help make a major difference. “Scientists are committed to finding the answers, and new insights are continually unfolding,” states the ALS Association. “We are committed to achieving our mission as rapidly, as efficiently and as effectively as we can…and we recognize time is of the essence,” ALS Association President Gary A. Leo states. Help Stop ALS will be keeping an updated contact list to inform our readers of recent news and events. Our first fundraising announcement will be out shortly. Not all fundraisers will be focused around racing; we will have a wide variety of amazing events throughout the year. Everyone’s help and involvement is needed to find a cure. Together we will help conquer this devastating disease and put an end to the suffering. Told in his own words on a local radio station. 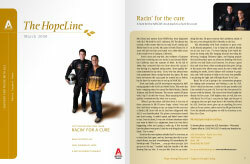 May 2008 Issue of The HopeLine. ASA Late Model Series® website.